Spooky Halloween Challenge … With a twist! This year we’re presenting a Halloween CG Art challenge that will be judged by all ShareCG users. The winning entries will be those that have the the most ratings and views. You’ll be able to see where the challenge stands by simply sorting the Art browse page by ratings and views. The challenge beings today, Friday September 23rd, and ends on Halloween day, October 31, 2011. No prizes will be awarded, but you will get a chance to strut your stuff for the ShareCG community and visitors, and the top 3 entrants will be featured prominently in the home page slide show, in the home page Art and Animation section, and in this blog. 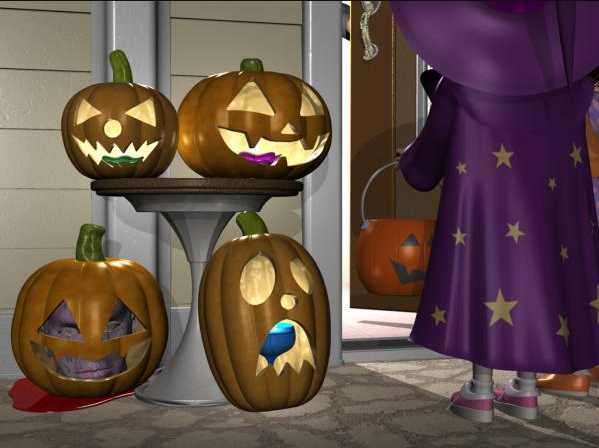 To enter just check the “Halloween 2011” check-box when you upload your masterpiece to the Art or Animation sections. We can’t wait to see your creativity! Good luck, and enjoy! You can enter multiple images or animations. However, the work must be original and yours. Entries may be inspired by and/or include a range of material from third parties. This is permissible as long as the finished entry is substantially a new work by the entrant(s). The appropriate use of this material in no way diminishes your finished work or the chances of winning. However, failure to correctly credit all inspirations, third party works, team members etc will result in automatic disqualification. You must credit any work you use as an inspiration for your entry. This does not diminish your work or the chances of winning in any way. Failure to acknowledge inspirational works will trigger an automatic disqualification. Your work will be all yours – you hold the Copyright. However, if it was based on any inspirational works that are not yours then you must credit it as a derivative work. You will be free to show your finished work anywhere you want as long as you include in the credit the original work and author. You cannot make any claim or imply in any way that you created the work for the original artist and must not allow your work to appear in any form under the original artists’ imprimatur.